Flowers are the stars of the Earth." Janet Akyüz Mattei (1943-2004) and the AAVSO were meant to be part of each other's lives. In 1969, Janet was teaching and working towards a Master of Science degree in her native Turkey when she learned about the summer research program under Dr. Dorrit Hoffleit at Maria Mitchell Observatory on Nantucket. That year Janet was introduced to variable stars and the AAVSO — and her future husband, Michael Mattei — on Nantucket: variable stars in her research with Dorrit, and Mike and the AAVSO through its meeting held there in October. A brilliant student and young scientist of great promise with an outgoing and enthusiastic personality, Janet was hired as AAVSO Director Margaret Mayall's assistant in 1972. When Margaret decided to retire, Janet was selected by the AAVSO Council in October 1973 to succeed Margaret as Director, a position she held for over 30 years until her death on March 22, 2004. During those 30 years Janet worked unceasingly on behalf of the AAVSO, its members and observers, and those who want to learn about astronomy and variable stars, and to further the field of variable star astronomy. She strove continually to teach the global astronomical and educational communities about the vital contributions that amateur astronomers make to variable star astronomy. Over and over again, in her talks she demonstrated how astronomers, educators, and students could enhance their research through utilizing the talents of variable star observers, the fruit of their labors — variable star observations — and the unique resources the AAVSO offered. Janet worked equally hard to encourage amateur astronomers to participate in variable star observing and research, to provide means for their learning information and techniques to enable them to succeed and find enjoyment in variable star work, and to see that they received recognition from the professional community for their vital contributions. She also believed firmly in the potential of young people, and supported and encouraged them however she could, including helping them explore the excitement of astronomy and scientific research. Janet's directorship took place during times of tremendous challenges and opportunities: the advent of satellite astronomy, the evolution of computer technology that opened up new vistas for communication and data management, instrumentation advances that gave amateur astronomers access to observing equipment only dreamed of before. Within the AAVSO itself, there were difficult times early in the 1980s, the exciting acquisition of a permanent Headquarters building, significant growth in the size of the staff, exponential growth in the size of the AAVSO International Database. Janet rose to these challenges and opportunities, staying flexible and open to new ideas and possibilities while remaining unyielding on the integrity, quality, and reliability of the AAVSO, its database, and its services and programs. Through Janet's vision and leadership, the AAVSO evolved as the world around it evolved, and it has prospered. Today's AAVSO — still evolving — participates in cutting-edge variable star research, offers multiple observing programs to observers, is strongly involved in education and public outreach, enjoys fruitful working relationships with many other variable star organizations around the world, and looks to the future for exciting new possibilities. However, AAVSO Director and scientist were only part of who Janet was. She was also spouse, daughter, sister, niece, aunt, cousin, friend, colleague, mentor. She gave of herself, her time, and her talents, and she felt honored and appreciative when people gave to her. She filled people's lives with joy, excitement, and satisfaction, and she rejoiced in the happiness and success of others. She told people when she was pleased for them, and perhaps more importantly, when she was concerned for them, and unfailingly asked — and honestly meant it — if she could help in any way. We will miss the gracious, caring, and enthusiastic bundle of energy that was Janet, with the smile in her voice, the kind word, the insightful comment, the big picture always in mind. Janet was enormously proud of the AAVSO and its members and observers. We were enormously proud of Janet, and we are grateful to her for giving herself to the AAVSO with such devotion, and for leaving us her personal legacy of striving for excellence, dedication, and compassion. The following poem was written by Janet's husband, Mike Mattei, while Janet was in the hospital. He read it at her funeral and requested that it be shared online. Standing next to me is my companion. Turn to them, look at them. Look into their eyes, for here is where you look into their soul. share with them a kiss. never, never, never let them go. Or to see the same slide show with manual controls, use this slide show . The AstroCon 2004 meeting which includes the AAVSO's 93rd Spring Meeting is dedicated to Janet A. Mattei. 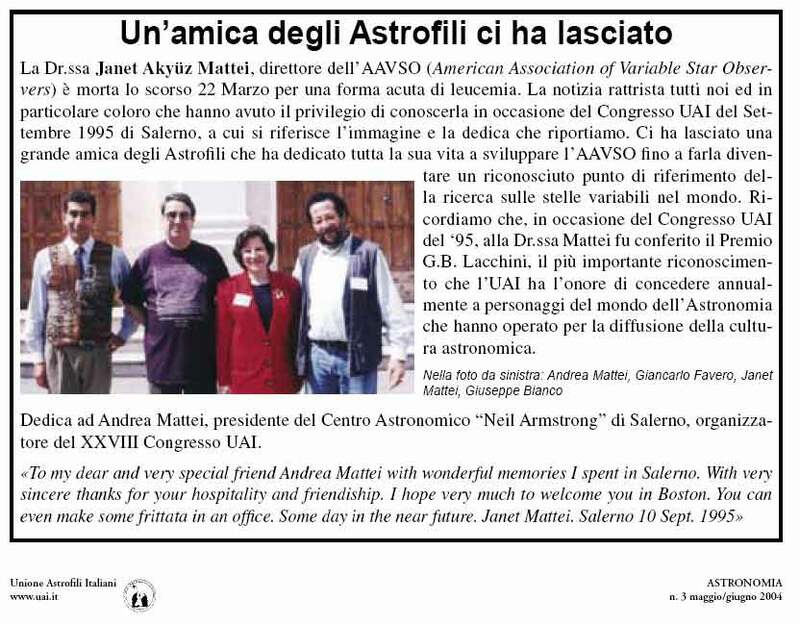 The "Unione Astrofili Italiani"  - a tribute  to Janet Mattei in the May-June 2004 issue of "Astronomia". Listen to David Levy's interview with Janet - Air date August 5, 2003 on "Let's Talk Stars"
Izmir American College recognizes minor planet "Mattei"